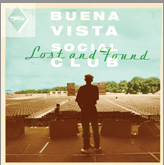 The Buena Vista Social Club were an international phenomenon, and yet the full band released only two albums: the bestselling 1997 studio set and a recording of their one US show in 1998, released 10 years later. Now, as the two surviving Buena Vista stars Omara Portuondo and Eliades Ochoa prepare for their final UK tour, comes an album of "previously unreleased tracks", and it includes two classics, both recorded during the original Havana sessions. Lost and Found (World Circuit) released March 23rd.